I want to be the fearless guy – the one who can do anything and not care what anyone thinks, or look like it. 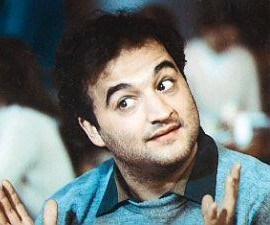 John Belushi comes to mind. Charles Bukowski. Bob Flanagan. Any stand-up comedian. I may have come close years ago in my bungy-jumping stage. If it was risky, I was willing to try it, or say it. Wrap a rubber band to my feet and let me jump. And I did. He didn't have a fear bone in his body, but he did have a lot of drugs. But it’s amazing how I’ve gone to the opposite extreme as I’ve aged. When I was younger, I didn’t care what happened to me. Now I have panic attacks because I’m afraid of dying in my sleep or on a plane. All it takes to set an attack in motion is a tweak in my chest for a fraction of a second. “Game on” in my head. With announcers, too. And then there is this blog. I want to takes risks, push the envelope, be fearless. But I don’t know if I have the courage to do it, and that makes me disappointed in myself. The fear I’ve developed over the years, combined with OCD, is a roller-coaster of bravery and panic. Up and down, up and down. Like yesterday and today. I pulled my first published post, the one written in the style of Charles Bukowski. I spent three days on it with my OCD firing like a rocket engine. I even held back in comparison to how far Bukowski pushes his prose. 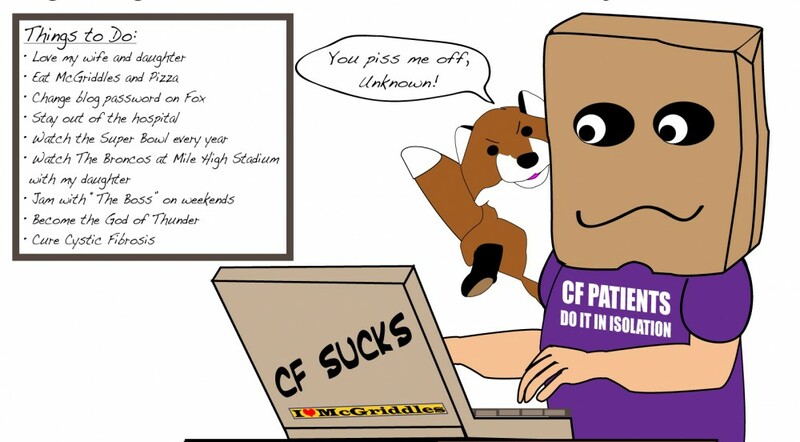 I think I got close to his style and how the world might have looked to him had he had cystic fibrosis. I knew the post pushed boundaries, even for this blog, and added a warning like you might find on property guarded by a crazy farmer with a loaded gun. But I thought the post was true to its subject. Then the “it sounded better in my head” part of fear crept in with: Are you crazy? But I summoned a crumb of courage and clicked “Publish” last night. Then I panicked. I wrote another post to push the Bukowski post back one notch. Done, in the past. No one will notice it. I felt better. Then I woke up this morning in “spiraling out of control mode” thanks to lower back/kidney pain (another post). What did I do? Not one comment. Not good. Hmm. Did I go too far? What will people think? I like the people who read my blog. I don’t even know them. But I do. They won’t understand the style and connect it to me. It is connected to me – I wrote it. The post is too far out there. But it’s mellow Bukowski compared to his works. It will be okay. Leave it, you wuss. So, I removed it. And I’m not sure how I feel now. Disappointed in myself because I pulled it? Perhaps. I take this blog seriously. It’s interesting to put writing out there for others to read and see how it’s interpreted. If there’s a silver lining to this story, it’s that I am pushing boundaries because my posts have made me uncomfortable lately. The question is: do I have the courage to keep pushing? If there’s there’s a blogging downside, it’s finding your own internal editor to tell you when you pushed too far, what’s gold or crap, and whether to hit “Publish” or “Move to Trash.” I can never tell. Maybe I need to ask: What would Bob Flanagan do?